While I am a teacher, I am also a graduate student in the top-rated History department at CSU Fullerton. I am privileged to read some outstanding monographs, some of which have been very useful and relevant to my teaching. I’ll do the heavy lifting of reading 500 pages a week, and I’ll share the best of what I find with you here. If you teach 8th grade US History, this book provides some great background knowledge for your chapter on Jackson’s presidency. Theda Perdue. Cherokee Women: Gender and Cultural Change, 1700-1835. Lincoln, NB: University of Nebraska Press, 1998. In traditional Cherokee culture, the sun represents woman and the moon represents man. The two serve separate purposes, yet they balance each other and are both necessary for survival. 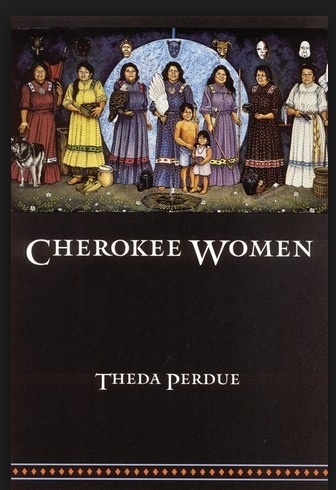 In Cherokee Women: Gender and Cultural Change, 1700-1835, Theda Perdue highlights this separate, but equally essential, aspect of women’s status within the Cherokee community. She traces the persistence and adaptations of Cherokee women as their tribe became increasingly intertwined with Americans. Perdue argues that Cherokee women had always maintained a significant and distinct position of power within Cherokee culture, and while contact with Americans threatened women’s status more directly than it threatened men’s, Cherokee women were agents of cultural conservatism, persistence and adaptation. Perdue is dissatisfied with the historiography of Native Americans, and Native American women in particular, as they are often hidden in the shadows. She intends for this book to influence gender history, and ethnohistory as well. Perdue applies the strategy of upstreaming in order to follow cultural patterns from the present to illuminate this shadowy history of Cherokee women. From oral histories and Cherokee legends (to which Perdue assigns equal credence as explorer diaries, missionary school records, and trade correspondence), it is clear that Cherokee women operated and controlled the agricultural realm fairly independently. Lineage was traced through mothers, and women had complete control over households. Men would move in with their wife’s family, and were often away from home, hunting. The Cherokee placed great emphasis on balance between the genders, and there was no hierarchical structure of men over women. The Cherokee’s first significant interaction with European settlers was through the rapidly growing deerskin trade. Perdue asserts that in order to fulfill the challenges of this new contact, men entered a modern sphere of commercialism and a market economy, while women, who still maintained the farms, were the conservators of traditional values. Soon, however, women adapted to using European iron farm tools, and for the first time they became dependent on men to hunt successfully (for deerskins or slaves) and trade for those items. In this new trading structure, Cherokee women maintained their traditional duties yet modified some of their practices. Perdue shows how elements of Henry Knox’s plan to “civilize” Native Americans through land ownership and farming also forced Cherokee women to simultaneously preserve traditions, adapt to new realities, and give up political influence. Because all aspects of agriculture were the women’s domain, they became responsible for animal husbandry, while the men continued to participate in wars and trade. Cherokee women incorporated their new task into their culture, but simultaneously began to lose their governing power as male warriors rose in political status. Again, Perdue underscores the agency that women demonstrated in fighting to maintain essential gender balance, while also adapting external changes.